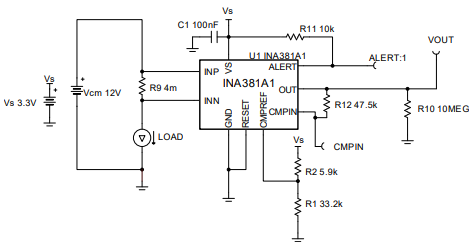 This is a unidirectional current sensing solution generally referred to as overcurrent protection (OCP) that can provide an overcurrent alert signal to shut off a system for a threshold current and re-engage the system once the output drops below a desired voltage lower than the overcurrent output threshold voltage. This entry was posted on Sunday, November 18th, 2018 at 5:00 pm	and is filed under app notes. You can follow any responses to this entry through the RSS 2.0 feed. You can skip to the end and leave a response. Pinging is currently not allowed.